(JEREMY)>> HEY GUYS, WELCOME TO THE SHOP. NOW IF YOU'RE A CHEVY GUY THEN TODAY WE'VE GOT SOMETHING FOR YOU. (LT)>> WE'RE WORKING ON OUR '89 KFIVE BLAZER, AND WE'RE GONNA CONTINUE TO MAKE PROGRESS ON THE FRAME OFF RESTORATION. GET THIS CHASSIS STRIPPED DOWN TO NOTHING AND WE'LL PREPARE IT TO RECEIVE SOME NEW COATING. (JEREMY)>> AND A LITTLE LATER WE'LL SHOW YOU A FEW THINGS ON PROJECT "SUPERMAX" TO HELP PLANT THAT REAR SUSPENSION. (LT)>> NOW LAST TIME YOU GUYS SAW OUR KFIVE BLAZER WE'D JUST GOT THE BODY BACK FROM THE SAND BLASTER, AND WE PUT IT IN SOME EPOXY COATING TO HELP PROTECT THAT BARE METAL. (JEREMY)>> BUT WE HAVEN'T DONE ANYTHING TO THE CHASSIS YET. IT'S STILL ASSEMBLED WITH THE OLD ENGINE, TRANS, AND AXLES. SO TODAY WE'RE GONNA STRIP ALL OF THIS STUFF OUT OF HERE, GET DOWN TO A BARE FRAME. (JEREMY)>> THE WORK BEGINS BY CUTTING OFF THE OLD EXHAUST AT THE HEADER AND BEHIND THE MUFFLER, AND TOSSING ASIDE THE OLD JUNK. NEXT UP WE'LL REMOVE THE TRANSFER CASE, MAKING SURE TO CATCH THE FLUID IN A DRAIN PAN. (LT)>> OUT BACK THE FUEL TANK CAN BE LOWERED FROM THE FRAME AND DRAGGED TO OUR GROWING PILE OF PARTS. NEXT THE VAPOR, FUEL, AND BRAKE LINES ARE REMOVED FROM THE FRAME AS ONE GROUP. (JEREMY)>> WE'LL ATTACH THE ENGINE AND TRANS TO OUR HOIST, AND REMOVE THEM FROM THE FRAME. THESE WON'T BE REUSED, BUT WILL NEED SOME BRACKETS AND SMALL PIECE. SO WE WON'T SEND IT OFF TO THE JUNKYARD JUST YET. (LT)>> THE REAR BUMPER IS NEXT ON THE LIST OF THINGS TO GO AWAY. (LT)>> WE'LL JACK UP THE REAR OF THE FRAME AND SLIP SOME STANDS UNDERNEATH. (JEREMY)>> THEN ATTACK THE LEAF SPRINGS NEXT. THE SLEEVES TEND TO RUST OUT IN THE MIDDLE OF THE BUSHINGS. SO WE'RE GONNA HAVE TO GET CREATIVE. FIRST WE'LL TRY TO CHIP AWAY THE BOLT AND SLEEVE INSIDE THE HANGER USING A CUTOFF DISC. THIS WILL GET ME CLOSE, BUT THE WHEEL ISN'T BIG ENOUGH TO REACH ALL THE WAY THROUGH. BY TURNING THE SLEEVE WE CAN REACH MORE OF IT, BUT IT'S STILL NOT ENOUGH. SO I'LL BRING IN THE BIG GUN, THE AIR HAMMER. USING A THING CHISEL I CAN SHEAR THE BOLT OFF INSIDE THE HANGER. YOU DONE WITH THAT THING YET, I NEED IT? (LT)>> WORKING ON IT! ON THE OTHER SIDE WE'RE ATTEMPTING TO USE A RECIPROCATING SAW TO CUT THROUGH THE SLEEVE, BUT IT'S SLOW PROGRESS. ONCE THE AIR HAMMER HAS SHEARED OFF THE BOLT WE'LL TRY TO PRY THE SPRING FREE USING THE MOTHER OF ALL PRY BARS. (JEREMY)>> WATCH THESE SKILLS WHEN I COME OFF HERE. MAY WHERE'D YOU GET, WHAT, AND YOU'RE THE ONE THAT GOT HURT, AND HE GOT HURT. YOU'RE PLAYING IT OFF WELL. (LT)>> I MIGHT HAVE BUMPED MY KNEECAP. AS YOU CAN SEE THIS SIDE IS BEING STUBBORN, BUT EVENTUALLY, WITH SOME DETERMINATION, WE DECLARED VICTORY OVER THE RUST. (LT)>> BAD, BAD LEAF SPRING. (JEREMY)>> I'M GONNA GO TAKE A BREAK NOW. (LT)>> AND WITH THE FINAL BOLT PUSHED OUT, WE CAN ROLL THE JUNKY 10 BOLT AWAY FROM THE BLAZER FOR GOOD. (JEREMY)>> OUT FRONT WE REMOVED THE UPPER SHOCK MOUNTS AND DISCONNECT THE STEERING GEAR FROM THE FRAME. (LT)>> WOO, THAT'S A CRACKED FRAME. (JEREMY)>> NEXT IS THE SWAY BAR FRAME MOUNTS, FOLLOWED BY THE SHACKLES. THEY SLIDE OUT NICELY WITH A FEW GENTLE TAPS OF A HAMMER. WITH THE FRONT OF THE SPRINGS DISCONNECTED, WE CAN ROLL THE AXLE OUT FROM UNDERNEATH THE CHASSIS. IT'S FOUR WHEEL DRIVE MAN. (LT)>> PUSH, PUSH, THERE YOU GO! (JEREMY)>> CLIMB ANYTHING! OVERALL TEAR DOWN WENT PRETTY SMOOTH, AND NOW WE HAVE A BIG PILE OF PARTS TO SORT THROUGH. NOW WE'LL BE REUSING SOME OF THESE, BUT REPLACING MOST. NOW THERE'S TWO DAMAGED AREAS THAT WE'LL HAVE TO TAKE CARE OF. ONE IS THIS REAR DRIVER BODY MOUNT THAT HAS A RUST HOLE IN IT, AND ANOTHER ONE IS A VERY COMMON PROBLEM ON THIS ERA OF FOUR WHEEL DRIVE TRUCKS, A CRACK IN THE FRAME RIGHT WHERE THE STEERING BOX MOUNTS. YOU CAN SEE IT STARTS AT THE BOTTOM AND RUNS ALL THE WAY UP NEAR THE TOP, AND IT'S ONE OF THE WORST ONES I'VE EVER SEEN. AS THE WHEELS AND TIRES MOVE WITH THE STEERING IT PUTS STRESS ON THE FRONT OF THE FRAME AND EVENTUALLY STARTS TO CRACK. NOW THIS IS A SAFETY HAZARD. SO WE'RE GONNA GO AHEAD AND GET IT TAKEN CARE OF. (NARRATOR)>> NEXT, JUST SAY NO TO CRACK! (LT)>> WE HAVE OUR KFIVE FRAME COMPLETELY STRIPPED DOWN AND WE'VE SHOWN YOU A COUPLE OF PROBLEM AREAS THAT WE NEED TO ADDRESS, AND WE'RE GONNA START BY STITCHING THE FRAME BACK TOGETHER WHERE THE STEERING BOX MOUNTS. TO HELP US OUT WITH THAT WE HAVE SOME NEW EQUIPMENT IN THE SHOP. THIS IS OUR MILLER DYNASTY 280 DX. IT'S A POWERFUL TIG WELDER THAT'S RATED AT UP TO 280 AMPS OF POWER. THAT MEANS IT'LL WELD THREEEIGHTHS INCH THICK STEEL OR ALUMINUM. NOW YOU CAN ACTUALLY RUN THIS IN A STICK CONFIGURATION, BUT FOR US WE'RE MOSTLY GONNA BE USING IT IN AC TIG OR DC TIG MODES FOR ALUMINUM AND STEEL. ONE OF MY FAVORITE PARTS IS THIS ACTUALLY HAS A LIQUID COOLED TORCH. THERE'S A RESERVOIR UNDERNEATH THE WELDER AND COOLANT IS ACTUALLY PUMP UP THROUGH THE HOSES INTO THE HEAD OF THE TORCH. ALL THE EXCESS HEAT IS CARRIED AWAY. NOW THIS MEANS WHEN WE'RE WELDING SUPER THICK MATERIAL WE CAN RUN MORE POWER FOR LONGER AMOUNTS OF TIME, AND THE TORCH WON'T MELT IN YOUR HAND. DEFINITELY COULD GET A LITTLE BIT PAINFUL. NOW FOR A TYPE OF REPAIR LIKE THIS WE ACTUALLY COULD USE A MIG WELDER, OR EVEN A STICK WELDER, WHICH IS WHAT IT LOOKS LIKE THEY USED ON THEIR LAST ATTEMPT. NOW THE REASON WE LIKE TO USE A TIG WELDER IS BECAUSE IT GIVES YOU A CLEANER, MORE PRECISE ARCH. YOU ONLY HAVE TO ADD FILLER MATERIAL WHEN YOU WANT IT, AND IT GIVES YOU A MUCH CLEANER LOOKING WELD WHEN YOU'RE ALL SAID AND DONE. NOW LIKE ANY GOOD WELDING REPAIR, WE NEED TO START BY CLEANING UP THE SURFACE. CLEAN METAL IS SUPER IMPORTANT FOR A STRONG WELD. BECAUSE THE INSIDE OF THE CRACK HAS SOME RUST AND GREASE, I'LL TAKE A THIN CUTOFF DISC AND MAKE A SMALL GROOVE ALONG THE CRACK. THEN CLEAN IT UP, AND MAKE A "V" FOR THE WELD TO FILL. ONE LAST PASS WITH THE FLAP WHEEL AND THIS BABY IS READY TO WELD. I'LL POWER UP THE TIG AND SWITCH IT TO DC MODE. I'M USING THE PULSE FEATURE TO LIMIT THE OVERALL HEAT INPUT INTO THE FRAME WHILE STILL BEING ABLE TO GET GOOD PENETRATION. THE DYNASTY 280 HAS A PRO SET FEATURE THAT HELPS TAKE SOME OF THE GUESS WORK OUT OF TIG WELDING. IT'S CONFIGURED TO PULSE 100 TIMES PER SECOND AND ONLY SPEND 40 PERCENT OF THE TIME AT PEAK POWER. IT'S PRETTY SIMPLE TO USE A TIG. JUST KEEP THE ELECTRODE CLOSE TO THE SURFACE, START THE ARC, AND HEAT UP THE BASE MATERIAL UNTIL IT STARTS TO MELT. THEN SLOWLY ADD FILLER. THERE ARE MANY METHODS BUT I AM DABBING THE FILLER IN. YOU SHOULD ALWAYS TRY TO KEEP THE TIP OF THE FILLER ROD INSIDE THE CERAMIC CUP OF THE WELDER SO IT STAYS IN THE ARGON SHIELDING GAS TO PREVENT OXIDATION. WITH A TIG WELDER THE POWER IS CONTROLLED WITH A FOOT PEDAL JUST LIKE THE ACCELERATOR ON A CAR. WHEN COMING TO AN EDGE OR A HOLE LESS POWER IS NEEDED TO PREVENT BURNING THROUGH. SO I'LL SIMPLY LIFT OFF THE PEDAL A BIT UNTIL I'M BACK IN THE MIDDLE OF THE MATERIAL OR DONE WITH THE "V". WELL WE HAVE THE FRAME ALL WELDED UP AND IT'S JUST AS STRONG AS IT WAS ON THE DAY THAT IT LEFT THE FACTORY, BUT OBVIOUSLY IT'S NOT STRONG ENOUGH BECAUSE THE CRACK HAPPENED IN THE FIRST PLACE. SO HOW ARE WE ACTUALLY GONNA REINFORCE THIS FRAME RATHER THAN JUST REPAIR THE DAMAGE? WELL WE WENT TO SUMMIT RACING AND PICKED UP THIS FRAME REPAIR KIT THAT FITS '67 TO '91 FOUR WHEEL DRIVE BLAZERS, SUBURBANS, AND PICK UP TRUCKS. IT'S JUST A STAMPED PIECE OF STEEL THAT SLIDES OVER THE FRAME. WE WELD IT INTO PLACE, AND IT'LL PROVIDE ENOUGH REINFORCEMENT THAT THIS PROBLEM IS NEVER GONNA HAPPEN AGAIN. I'LL HOLD UP THE PLATE AND ROUGHLY MARK THE OUTSIDE OF THE FRAME SO I KNOW WHERE THE EDGES WILL BE. THEN A GRINDER WITH A 40 GRIT FLAP WHEEL IS USED TO REMOVE ALL THE PAINT FROM THE REPAIR AREA. I'LL ALSO FLATTEN THE NEW WELDS SO THE PLATE CAN SIT FLAT AGAINST THE FRAME. I'LL AGAIN MARK THE EDGES OF THE PLATE AND THE HOLES IN THE CENTER. THEN MASK OVER THOSE AREAS. 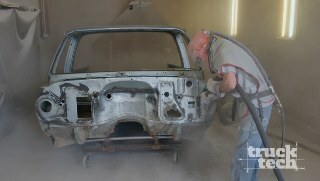 BY USING SOME DUPLICOLOR WELD THROUGH PRIMER, THE INSIDE OF THE REPAIR CAN BE PROTECTED FROM RUST. WITH THE PAINT DRY I'LL BOLT THE PLATE ONTO THE FRAME AND TIGHTEN IT UNTIL IT MAKES CONTACT. A "C" CLAMP HELPS PRESS THE PLATE TO THE FRAME, AND I CAN BEGIN WELDING THE HOLES IN THE CENTER AND WORK MY WAY OUT. IT'S A SIMPLE PROCESS OF CLAMP, HAMMER, WELD, AND REPEAT. NOW THIS IS A BIT OF A TEDIOUS JOB. I'M NOT GONNA LIE. IT DOES TAKE SOME TIME. IT'S NOT HARD WORK, JUST TIME CONSUMING. YOU'VE GOT TO MAKE SURE THIS PLATE FITS PERFECTLY ON THE FRAME SO THERE'S NO GAPS WHEN YOU GO TO WELD IT UP, BUT IF YOUR FRAME IS CRACKED THERE'S REALLY NO OTHER OPTION. NOW THIS KIT ALSO COMES WITH ANOTHER PLATE THAT MOUNTS UP UNDERNEATH THE FRAME AND TIES INTO THE CROSSMEMBER, PROVIDING EVEN MORE STRENGTH. NOW AS FOR ME, I'VE GOT SOME MORE HAMMERING AND WELDING TO DO. (NARRATOR)>> NEXT WHEEL HOP, AND HOW TO CURE IT. (LT)>> WE HAVE PROJECT "SUPERMAX" BACK IN THE SHOP AND IT'S TIME TO TURN OUR ATTENTION TO THE REAR SUSPENSION. IF YOU HAVE A POWERFUL VEHICLE WITH LEAF SPRINGS AND STICKY TIRES THAT CAN BE A BIT OF RECIPE FOR DISASTER. AS YOU ACCELERATE THE PINION ON THE REAR DIFFERENTIAL ACTUALLY WANTS TO CLIMB UP. THIS CREATES A TWISTING FORCE AGAINST THE REAR SPRINGS THAT WE CALL AXLE OR SPRING WRAP. NOW THAT CAN LEAD TO WHEEL HOP, WHICH WILL BREAK PARTS. NOW FROM THE FACTORY THIS HD SILVERADO HAD AN OVERLOAD LEAF SPRING TO HELP PREVENT SOME OF THAT TWISTING, BUT IT MAKES THE TRUCK RIDE VERY ROUGH. SO WHEN WE SHORTENED THE FRAME WE TOOK THESE OUT. THE TRUCK RIDES MUCH SMOOTHER BUT IT WHEEL HOPS EVEN MORE. NOW THERE ARE SOME DIFFERENT SOLUTIONS ON THE AFTERMARKET. WE CALLED UP McGAUGHY'S AND PICKED UP A SET OF THEIR BRAND NEW BOLT IN TRACTION BARS, AND HERE'S HOW THEY WORK. 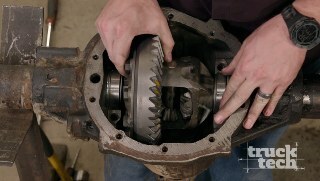 A BRACKET SITS UNDERNEATH THE AXLE, AND AS IT TWISTS IT PUSHES FORWARD ON A BAR. THE OTHER END ATTACHES TO THIS SWING SHACKLE, AND WHEN IT MOVES A URETHANE SNUBBER MAKES CONTACT AND THE AXLE IS NO LONGER ALOUD TO WRAP, AND THE TRUCK JUST ACCELERATES. NOW THESE ARE POWDER COATED 60 INCH LONG FABRICATED BARS. 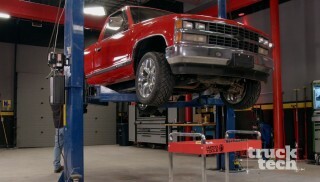 THEY'LL LOOK AT HOME ON A LIFTED, EXTENDED, OR A CREW CAB TRUCK. YOU CAN BUY THESE TO FIT ALMOST ANY LATE MODEL APPLICATION, BUT THEY'RE A BIT LONG FOR US. REMEMBER WE HAVE A REGULAR CAB SHORT BED TRUCK. NOW IF WE PUT THESE ON AS IS THE FRONT WOULD MOUNT ABOUT AT THE TRANSMISSION CROSSMEMBER. WE WOULDN'T HAVE ANY GROUND CLEARANCE AND IT JUST WOULDN'T LOOK RIGHT. SO WE PICKED UP SOME DOM TUBING AND WE'LL SHOW YOU HOW TO MAKE YOUR OWN SHORTER LINK BARS THAT WORK WITH THE McGAUGHY'S AXLE BRACKETS AND THE SWING SHACKLE. I'LL START WITH THE TUBING NOTCHER AND CUT THE END OF THE PIPE. NEXT I'LL CLAMP THE BAR IN A VICE AND DEBURR THE ENDS, AND CLEAN IT UP FOR WELDING. I'LL SET THE SLEEVE ON THE END AND MAKE A TACK WELD USING OUR DYNASTY TIG. SPIN IT AROUND AND ANOTHER TACK WELD SEALS THE DEAL. I DID SOME MOCK UP AND FOUND THE BAR NEEDS TO 37 INCHES CENTER TO CENTER. I'LL MEASURE FROM THE INSIDE OF THE SLEEVE OUT TO 37. THEN TAKE OFF THE INCH AND THREE QUARTERS FOR AN INSIDE LENGTH OF 35 AND ONE QUARTER. I'LL LEAVE ABOUT AN EXTRA INCH AND A HALF AND CUT OFF THE EXCESS LENGTH. THE TUBING NOTCHER ISN'T QUITE LEVEL. SO I'LL ROTATE THE OTHER END OF THE TUBE TO MATCH. WITH THE CLAMP TIGHTENED I CAN MAKE THE CUT. FROM HERE IT'S THE SAME PROCESS AS BEFORE. LASTLY A QUICK COAT OF CHASSIS BLACK PAINT WILL KEEP THE LINKS FROM RUSTING. THE FACTORY LOWER UBOLT PLATES HAVE TO GO. THEY GET REPLACED BY THE McGAUGHY'S LOWER MOUNT. THEN I CAN INSTALL THE BAR AND SLIDE IN THE BOLT. I'LL USE A SMALL SPACER TO KEEP A GAP BETWEEN THE BUMPER AND CLAMP IT ONTO THE FRAME. ONCE ALL THE HOLES ARE DRILLED AND THE HARDWARE ATTACHED, THE TRACTION BARS ARE READY TO ROCK. WE BROUGHT THE TRUCK OUTSIDE TO SHOW YOU HOW THESE TRACTION BARS WORK. I'LL FOOT BRAKE IT AND BUILD UP JUST A LITTLE BIT OF BOOST AND LET HER RIP. YOU CAN SEE THE BARS IN ACTION AND THE TRUCK JUST TAKES OFF WITH NO WHEEL HOP AT ALL. (NARRATOR)>> AHEAD, SOMEONE'S TRASH IS OUR TREASURE. (LT)>> SINCE JEREMY IS BACK AT THE SHOP CATCHING UP ON SOME PAINT STUFF, I GRABBED PAT FROM ENGINE POWER AND WE HIT THE ROAD TO LOOK FOR A REAR AXLE FOR OUR BLAZER. LET'S DO THIS! 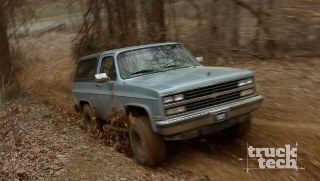 WE PLAN ON ADDING SOME BIG BLOCK POWER AND BIG OLE TIRES TO OUR KFIVE BLAZER. SO WE NEED TO DITCH THAT WIMPY 10 BOLT REAR AXLE IN FAVOR OF SOMETHING JUST A LITTLE BIT STRONGER. (PAT)>> WE ARE AT EXPRESS PULL AND SAVE IN LAVERGNE, TENNESSEE. NOW THIS IS A SELF SERVICE YARD WITH A WHOLE LOT OF INVENTORY. SO WE SHOULDN'T HAVE ANY PROBLEM FINDING AN AXLE THAT WILL WORK IN THE BLAZER. (LT)>> ALL KINDS OF GOOD STUFF HERE. THERE ARE A TON OF DONOR VEHICLES TO CHOOSE FROM. 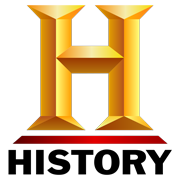 WE'RE PRIMARILY LOOKING FOR A THREE QUARTER OR A ONE TON TRUCK WITH AN EIGHT BOLT REAR AXLE. NOW THIS SUBURBAN HAS A 14 BOLT SEMI FLOATING AXLE WITH A NINE AND A HALF INCH RING GEAR. NOW THEY'RE PRETTY STRONG, BUT IT'S NOT AS STRONG AS ITS FULL FLOATING COUSIN. NOW HERE'S AN EASY WAY TO TELL THE DIFFERENCE. THE FULL FLOATERS HAVE A BIG OLE HUB THAT STICKS THROUGH THE CENTER OF THE WHEEL. THE SEMI FLOATERS JUST HAVE THIS SMALL BOSS THAT HELPS KEEP THE WHEEL CENTERED. 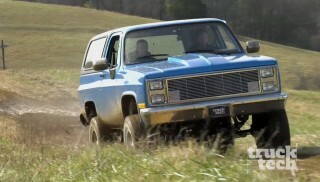 NOW THIS AXLE IS STRONGER THAN THE 10 BOLT THAT'S UNDER THE BLAZER, BUT THERE ARE BETTER OPTIONS. SO WE'RE GONNA KEEP LOOKING. 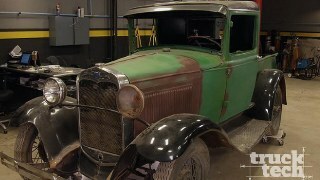 (PAT)>> IT REALLY DOESN'T MATTER WHAT THIS AXLE COMES OUT OF, DODGE, CHEVY, FORD, AND WE HAVE SOME GREAT OPTIONS IN THIS AREA, LIKE THIS DODGE, AND THIS IS RIG, WHAT LOOKS TO BE AN OLD FORD. NOW BOTH OF THEM HAVE DANA 60 REAR ENDS. NOW THE DANA 60 IS A GREAT AXLE. IT HAS A SLIGHTLY LARGER NINE AND THREE QUARTER INCH RING GEAR, AND IT IS A FULL FLOATER DESIGN, WHICH MAKES IT IDEAL FOR HEAVY DUTY APPLICATIONS LIKE TOWING OR OFF ROADING. NOW BOTH OF THOSE ARE GREAT OPTIONS BUT I THINK WE'RE GONNA FIND SOMETHING EVEN A LITTLE STRONGER, MAYBE WHERE LT'S LOOKING IN THE WEEDS. (LT)>> NOW WE THINK THIS IS THE AXLE THAT WE NEED. IT'S A GM 10.5 INCH 14 BOLT FULL FLOATER, AND IT'S PROBABLY THE STRONGEST JUNKYARD AXLE THAT WE'RE GONNA FIND. SO LET'S GET STARTED TEARING IT OUT. THAT'S SHOWING HER WHO'S BOSS. I THINK SHE'S FREE. YEAH BABY! (LT)>> ABOUT 20 MINUTES LATER WE HAVE OURSELVES A BEEFY 14 BOLT AXLE FOR OUR KFIVE BLAZER. WE'LL LOAD IT UP ONTO A CART AND GET BACK TO THE SHOP WHERE I CAN START CLEANING IT UP. 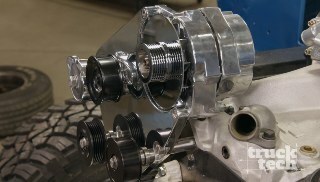 ALL FOUR STROKE ENGINES NEED THE SAME BASIC THINGS TO RUN PROPERLY, FUEL, AIR, AND SPARK. MORE SPECIFICALLY, THE CORRECT AMOUNT OF FUEL HAS TO BE MIXED IN WITH THE AMOUNT OF AIR THAT THE ENGINE IS SUCKING IN, AND THE SPARK HAS TO BE DELIVERED AT THE EXACT RIGHT TIME. TODAY WE'RE GONNA TALK ABOUT SOME OF THE SIMILARITIES AND DIFFERENCES BETWEEN MODERN AND VINTAGE ENGINES, AND HOW THE CORRECT AMOUNT OF FUEL WILL BE DELIVERED. A CARBURETOR IS DEMAND BASED. AS THE THROTTLE PLATES OPEN UP AND MORE AIR IS SUCKED INTO THE ENGINE MORE FUEL COMES ALONG WITH IT, AND THEY'RE SIMPLE TO TUNE. IF YOU'RE RUNNING LEAN AND NEED MORE FUEL SIMPLY INSTALL LARGER JETTING, OR IF YOU'RE RUNNING RICH SMALLER JETS ARE REQUIRED. MODERN ENGINES RELY ON INJECTORS TO DELIVER FUEL INTO THE ENGINE, AND THE LONGER THEY'RE HELD OPEN THE MORE FUEL IS LET IN. NOW THEY'RE CONTROLLED BY A COMPUTER, BUT HOW DOES A PIECE OF ELECTRONICS KNOW EXACTLY HOW MUCH FUEL YOUR ENGINE NEEDS TO RUN PROPERLY, CAUSE AFTER ALL COMPUTERS ARE DUMB, BUT IF THEY CAN MEASURE EXACTLY HOW MUCH AIR IS ENTERING THE ENGINE IT CAN CALCULATE EXACTLY HOW MUCH FUEL IT NEEDS TO RUN PROPERLY. 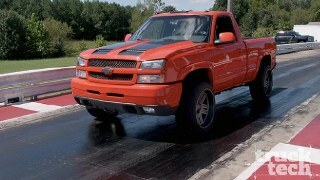 NOW HERE I HAVE A TUNE FILE FOR A 2002 SILVERADO POWERED BY A FIVE POINT THREE VORTEC PULLED UP IN HP TUNER SOFTWARE. THIS IS THE MAIN TABLE THAT CONTROLS FUELING. AS YOU CAN SEE, ALONG THE TOP IS ENGINE RPM, AND ON THE SIDE IS MANIFOLD PRESSURE MEASURED IN KILOPASCALS, OR KPA, AND THESE VALUES ARE VOLUMETRIC EFFICIENCY, OR VE. 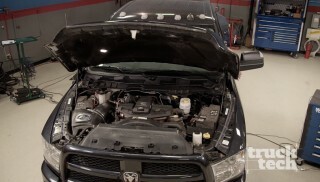 THE MOST IMPORTANT INFORMATION AN EFI CONTROLLER HAS TO KNOW IS EXACTLY HOW MUCH AIR IS ENTERING THE ENGINE RIGHT NOW. WITH THIS INFORMATION IT CAN DO SOME SIMPLE CALCULATIONS AND FIGURE OUT HOW MANY MILLISECONDS TO PULSE THAT FUEL INJECTOR, LETTING THE CORRECT AMOUNT OF FUEL INTO THE ENGINE. NOW THESE CALCULATIONS ARE HAPPENING HUNDREDS OF TIMES PER SECOND. LET'S SAY FOR EXAMPLE YOUR ENGINE'S IDLING. WE'D BE IN THE NEIGHBORHOOD OF 800 RPM AND 35 KPA WITH A VE OF 60 PERCENT. THESE VALUES WERE ORIGINALLY CALCULATED BY OEM ENGINEERS DURING DEVELOPMENT, OR IF YOU'RE CAR'S BEEN MODIFIED THEY'VE PROBABLY BEEN UPDATED BY A TUNER. NOW TYPICALLY HERE'S WHAT YOU CAN EXPECT TO SEE IN A VE TABLE. AS RPM AND MANIFOLD PRESSURE INCREASE SO WILL THE VE. NOW LET'S SAY YOU INSTALL A LARGER PERFORMANCE CAM SHAFT. WELL IT'LL BE LESS EFFICIENT AT LOW ENGINE SPEED. SO IF NO OTHER CHANGES HAVE BEEN MADE IT'LL BE RUNNING TOO RICH. SO A TUNER WILL COME IN AND LOWER THE VE VALUES AT THOSE LOW ENGINE SPEEDS, TAKING AWAY THE EXTRA FUEL. THEY'LL PROBABLY ALSO RAISE THE VE VALUES AT HIGH SPEED TO MAKE UP FOR THE EXTRA AIR FLOW OF THAT PERFORMANCE CAM SHAFT. NOW WE'RE REALLY JUST SCRATCHING THE SURFACE OF PERFORMANCE TUNING, BUT IF YOU WANT TO LEARN MORE ABOUT FUEL INJECTION THE VE TABLE IS A GREAT PLACE TO START. 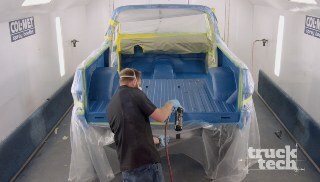 (JEREMY)>> PROTECTING YOUR PAINT JOB IS SOMETHING WE TRUCK GUYS OFTEN OVERLOOK. FOR OUR EL CAMINO THAT MEANS A CUSTOM FORM FIT COVER FROM COVERCRAFT. IT FEATURES SHEERED COTTON FLEECE ON THE INSIDE THAT WILL PROTECT DURING LONG PERIODS OF STORAGE, AND ON THE OUTSIDE AN OUTER SHELL OF WOVEN KNIT POLYESTER THAT HAS SPANDEX ADDED FOR STRETCH AND MEMORY, AND THE BODY HUGGING FIT ASSURES IT WILL RETAIN ITS SHAPE. ORDER YOURS AT COVERCRAFT DOT COM. (LT)>> EVERY ENGINE NEEDS FUEL TO RUN, AND AN ELECTRIC FUEL PUMP IS AN EFFICIENT WAY TO GET THAT FUEL FROM THE TANK UP TO THE ENGINE. THESE ARE EDELBROCK UNIVERSAL MICRO ELECTRIC FUEL PUMPS, AND THEY'RE SO COMPACT YOU CAN MOUNT THEM ALMOST ANYWHERE, AND THEY'RE SO QUIET YOU WON'T EVEN KNOW THAT THEY'RE RUNNING. NOW THEY'RE EASY TO INSTALL WITH ONLY TWO WIRES TO HOOK UP, AND YOU CAN EVEN USE THEM AS A TRANSFER PUMP. 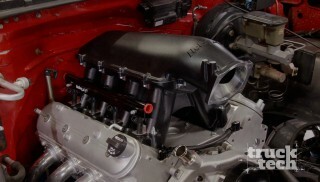 NOW EACH OF THESE ARE RATED AT ABOUT 400 HORSEPOWER, AND THEY'LL PUSH BETWEEN FOUR AND SEVEN PSI. THIS ONE'S FOR GASOLINE, AND THIS ONE'S FOR DIESEL. ORDER YOURS AT EDELBROCK DOT COM. (JEREMY)>> LIZARD SKIN HAS BEEN THE LEADER IN AUTOMOTIVE INSULATION WITH THEIR LINE OF PRODUCTS, BUT NOW THEY'VE TAKEN IT A STEP FURTHER WITH THEIR LIZARD SKIN TOP COAT. YOU APPLY IT OVER LIZARD SKIN SOUND CONTROL OR THEIR CERAMIC INSULATION. IT IMPROVES DURABILITY AND ADDS A BLACK GLOSSY FINISH TO IMPROVE GOOD LOOKS. IT'S PERFECT FOR FLOOR PANS, WHEEL WELLS, OR THE UNDER SIDE OF YOUR TRUCK, AND IT HAS A NONSKID FINISH. ONE 15 OUNCE CAN COVERS ABOUT 12 SQUARE FEET. FOR MORE INFO CHECK OUT LIZARD SKIN DOT COM. 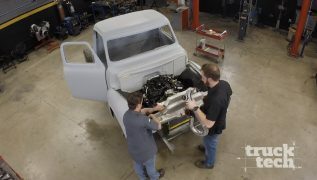 THANKS FOR WATCHING TRUCK TECH, SEE YOU NEXT TIME.